Apple is working already on a fix for various problems Snow Leopard users ran into after updating to the new operating system. Only a week after introducing Snow Leopard, Apple began seeding to developers an update addressing stability and compatibility issues. 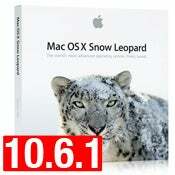 As with any operating system upgrade, many users reported various problems with Snow Leopard. But Apple has already many fixes prepared and is testing them with the developer community, the World of Apple blog reports. Also, the 10.6.1 Snow Leopard update is set to address the Adobe Flash vulnerability concerns that surfaced on Thursday. Snow Leopard downgraded users' Adobe Flash player without their knowledge, leaving them vulnerable to attacks. The 10.6.1 update will fix this issue and will install the latest version of Adobe Flash, 10.0.32.18. It is yet unknown when the Snow Leopard 10.6.1 update will be released to the general public, but expect it to arrive in your Software Update sometime within the coming week.